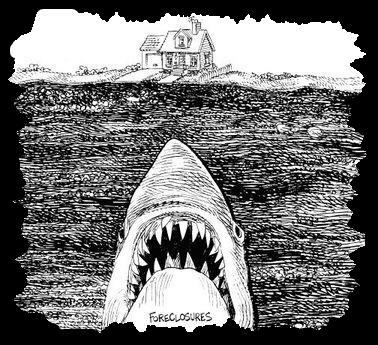 Continuing to put downward pressure on home prices are steadily increasing foreclosures, with no end in sight. As unemployment continues and loans continue to recast to higher interest rates, more homes will enter foreclosure further depressing prices. As these prices decline, more and more homeowners, even those who can afford to make their monthly payments will choose to walk away as their equity disappears. We were in the calm and quiet eye of the storm this summer, now comes the other side of the housing hurricane. According to RealtyTrac and as reported by CNNMoney.com, the third quarter of 2009 ending last month showed 937,480 homes receiving a foreclosure notice. One in 136 homes is now in foreclosure which is a 5% increase from just last quarter, and a 23% increase year-over-year from the third quarter of 2008. As predicted in my “housing tsunami” post on September 5, the number of foreclosures would accelerate as Americans continue to find themselves suddenly on the unemployment line, and the second round of adjustable rate mortgages recast to higher interest rates sending another wave of foreclosed homes onto the market. What’s also hard to envision, are the millions of people living for months in these homes for free while the rest of us suckers stupidly pay our monthly rent or mortgage payments. I’d love to live in a shadow inventory home for free too if all I had to do was cut the grass and wash the windows. The chickens from our debt fueled partying are coming home to roost. Shadow inventory will eventually become real inventory flooding the market, unemployment will continue to create new foreclosures, recasts will send more homes into default, government tax credits are coming to an end and the FHA is about to implode, all of which will crater prices driving even more people to turn over their keys as their equity vanishes in a puff of smoke. This will be one hell of a hangover.